Type of trauma can be considered as a factor determining the incidence and severity of root resorption in developing dentition. Avulsion of permanent teeth is one of the most serious dental injuries and the prognosis is dependent on the duration of extra-alveolar time, the mode of transportation of avulsed tooth, and the presence of viable periodontal (PDL) cells on the root surface before replantation. 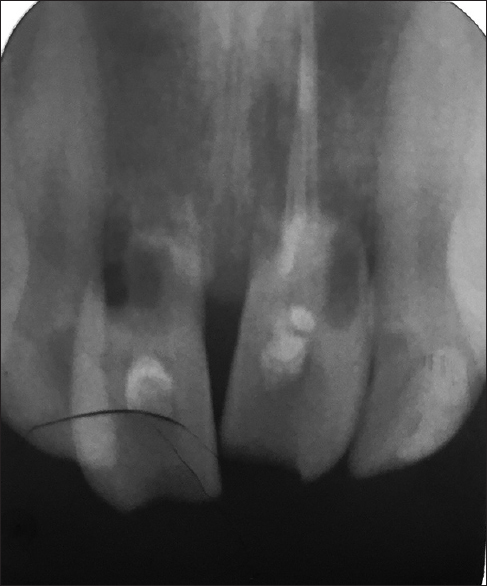 External root resorption was most frequently associated with intrusive luxation (92.8%) followed by avulsion (89.0%), lateral luxation (80.2%), and extrusive luxation (77.4%). Replacement resorption was observed more frequently in cases of reimplantation following avulsion (87.2%). Resorption can be diagnosed more accurately at least 3 weeks after trauma. Regarding external root resorption, the incidence of surface root resorption was 13.3%, that of inflammatory root resorption was 23.2%, and that of replacement root resorption was 51%. The incidence of root resorption after avulsion and replantation in descending order was reported as replacement root resorption > inflammatory root resorption > surface root resorption > internal root resorption. Parent compulsion is the reason for delayed replantation after avulsion of teeth in most of the cases, even though a poor prognosis is explained to them as per the guidelines given by International Association of Dental Traumatology (IADT). Delayed replantation of avulsed incisors is followed by ankylosis of the tooth. The progression of the disease process postankylosis in human subjects leading to inflammatory and replacement resorption had been rarely discussed in the literature. The present case series discussed the long-term prognosis of five cases of delayed replantation of avulsed incisors, which were replanted after prolonged dry, extra-alveolar time (more than 24 h). In this case series, no efforts were made to use any agent for root surface treatment before replantation. The survival of reimplanted incisors after a follow-up of 24–36 months was also evaluated. The review focuses on various patterns of external root resorption, alveolar bone resorption, and its significance for future prosthetic and implant restorations. Children with avulsion of permanent maxillary incisors were randomly included in the case series. In all the cases, there was a delay of more than 24 h in reporting and seeking treatment. Written consent from each patient as well as parent was obtained before the beginning of treatment. The available treatment options were explained to the patient and parents with the possible treatment outcome before the teeth were replanted. The avulsed teeth were debrided with normal saline solution and disinfected. No root surface treatment was carried out before replantation. Extraoral endodontic therapy was carried out on all replanted teeth except in Case I. Immobilization was performed by an acid-etched composite splint for 4 weeks except in Case II. The replanted teeth were followed up to a cumulative period of 24–36 months and the resorption patterns were evaluated by intraoral periapical radiographs (IOPA's). All replanted teeth were mobile after approximately 24–36 months and indicated for extraction. A 14-year-old boy had reported with avulsion of 11 and severe extrusive luxation of 21. No endodontic therapy was initiated before reimplantation, due to poor patient compliance. The patient reported after 2 years with mobility of both the teeth and sinus openings in the labial vestibule. IOPA showed a radiolucency involving 11, 21 indicating severe resorption of both the roots representing “inflammatory resorption” [Figure 1]. A 9-year-old boy had reported with avulsion of 11 2 years ago. The teeth were reimplanted and splinted with an arch bar for 4 weeks. The patient reported after 5 months for splint removal. Orthopantomogram showed a radiolucency involving 11 indicating severe resorption of the root representing “inflammatory resorption” [Figure 2]. After 2 years, mobility was found with 11. A 10-year–old boy had reported with avulsion of 11 due to a traumatic episode. After 2 years of follow-up after reimplantation, the tooth was found to be discolored and clinically mobile. IOPA revealed complete loss of root, which was replaced by bone indicating classical “replacement resorption” [Figure 3]. A 12-year-old boy had reported with avulsion of 11 and luxation of 12. After 2 years of follow-up after reimplantation 12 was fractured at the cervical level and 11 was clinically mobile. However, the gingiva was healthy, but tooth was discolored. A cone-beam computed tomography (CBCT)–maxilla was advised to evaluate the roots and periapical alveolar bone for the future prosthesis. CBCT revealed that the entire root of 11 was replaced by bone indicating, “replacement resorption” [Figure 4]. A 12-year–old boy had reported with avulsion of 11 and 21. After 2 years of follow-up after reimplantation, both the teeth became mobile, the gingiva was healthy in relation to 21, but a pinkish discoloration was evident over 11. IOPA revealed that the entire root space of 11 and 21 was replaced by bone indicating “replacement resorption” [Figure 5]. Both the teeth were extracted. [Figure 6]. A comprehensive review of previous studies in the literature on replacement resorption has been discussed in [Table 1] and the newer methods to delay the process of replacement resorption have been discussed in [Table 2]. Reimplantation of avulsed incisors after a considerable delay of more than 60 min has a compromised prognosis. However, it is often attempted, even when the delay is more than 12–24 h. Parent compulsion is the reason behind most of the cases, as it fulfills the esthetic requirement of the growing child, thereby fulfilling the psychological needs of the child. A well-known phenomenon is the sequelae of delayed replantation, that is, ankylosis followed by external root resorption. External inflammatory resorption and replacement resorption are complicating factors that may result from traumatic dental injuries when the tooth is luxated or avulsed and replanted. Root resorption is physiologic in deciduous teeth but is considered to be pathological in permanent teeth. The association between pulp necrosis and external root resorption has been known for many years. Elimination of infection and prevention of pulp necrosis during replantation represent the best means of preventing inflammatory root resorption. In Case I, pulp was not eliminated, as no endodontic therapy was initiated, hence inflammatory root resorption was evident after 2 years of follow-up. 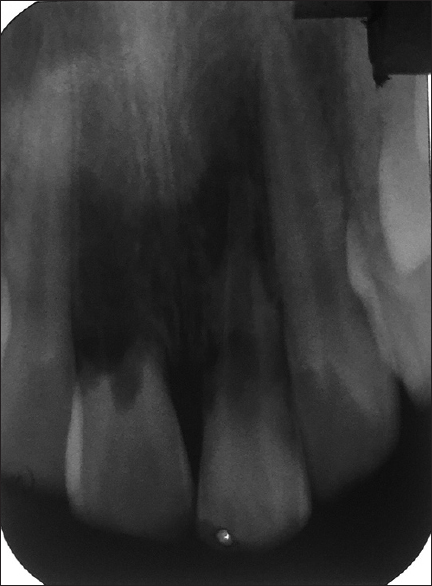 In avulsion, damage to PDL is more severe, hence replacement resorption is evident in most of the cases. Replacement resorption leads to fusion of tooth root with adjacent alveolar bone. Ankylosis of teeth following traumatic injuries occurs when osteoclasts originating from the surrounding alveolar bone are immediately followed by osteoblasts and reach the root surface after crossing the damaged PDL and precementum. In older children, this process produces bony replacement of the root cementum and root dentin, that is, replacement resorption eventually results in loss of the crown either spontaneously or by surgical intervention. In the Cases III and IV and V, similar types of replacement resorption were evident, hence these replanted teeth were extracted subsequently. Healing of PDL ligament and long-term prognosis of replanted avulsed teeth should rely on several factors including length of extraoral dry time and type of the storage medium. When the total extra-alveolar time interval from injury to the replantation of avulsed tooth is too long, the PDL and pulp are to be considered as necrotic. Dehydration, PDL cellular vitality, and mechanical trauma all affect the prognosis of a replanted tooth. PDL vitality is the primary factor in the prevention of ankylosis. Replacement resorption leads to fusion of tooth root with adjacent alveolar bone, that is, ankylosis. Ankylosis of teeth following traumatic injuries occurs when osteoclasts originating from the surrounding alveolar bone and subsequently followed by osteoblasts, reach the root surface after crossing the damaged PDL and precementum. 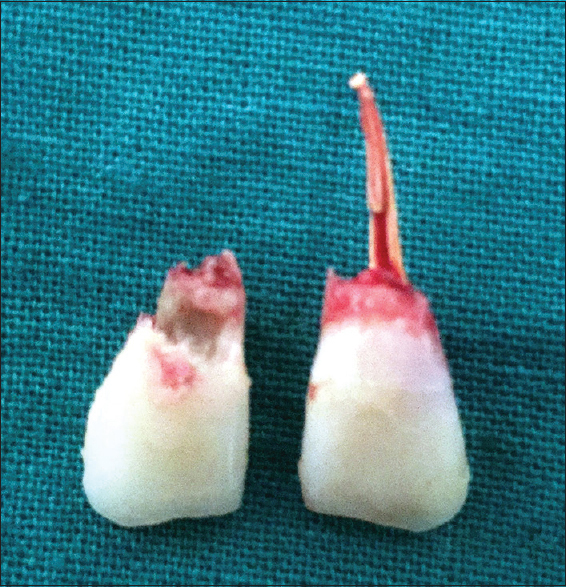 The progression and rate of replacement resorption are variable and depends on age, basal metabolic rate, extra-alveolar time, root surface treatment before replantation, amount of root dentin, severity of trauma, and extent of PDL necrosis. It has been reported that replacement resorption is 16 times more probable in replanted teeth when related to mobility impairment. The longer the period before replantation, the higher the chance of development of replacement resorption. Absence of PDL can stimulate bone cells to form new tissue, remodeling the traumatized area. In delayed replantation, healing occurs by repair rather than by regeneration. In the present case series, Cases II, III, and IV had shown healing by repair. In children who have not achieved skeletal maturity, replacement resorption leads to progressive infraocclusion, especially during the adolescent growth spurt. Adolescents and their parents often do not want to have these incisors extracted, even though the alveolar and gingival architecture becomes increasingly distorted with growth. Heithersay GS suggested that time is a critical factor in successful replantation. Endodontic therapy is performed before replantation if there is a delay of more than 2 h and in cases, where apex formation is complete it should be commenced within 10 days after replantation. According to the guidelines given by IADT, if the extra-alveolar dry time is more than 60 min before replantation, as in the current case series, extraoral root canal treatment can be carried out before replantation. Replacement resorption occurred early and rapidly, where extraoral endodontic therapy was performed as in Case III, IV, and V of the current case series. The evidence appears to be inconclusive to confirm any association between short-term splinting and increased likelihood of functional PDL healing or decreased incidence of replacement resorption. Hence, it is recommended that dentists continue to use the currently-recommended splinting periods when replanting avulsed permanent teeth. Hence, in the current case series, acid-etch composite splint for 4 weeks had been carried out in all the cases, as per the IADT guidelines. Mine et al. demonstrated that ankylosis following a tooth reimplantation may be prevented by applying occlusal forces on the tooth at a later date to stimulate PDL regeneration. Healthy tooth–PDL bone structures can be achieved with basic fibroblastic growth factor combined with occlusal forces, which ultimately enhance the production of the growth factor. However, in the present cases, no attempt was made to apply any root surface agents before replantation, as the immediate availability of various agents is not possible in all clinical settings. According to Panzarini et al., when there are no PDL remnants and root contamination is under control, replacement resorption, and ankylosis are the best results followed. Although these events will end up leading to tooth loss, this will happen slowly without any loss of alveolar ridge height, which is considered important for future prosthesis planning. Hence, in the present case series, tooth replantation is done, even after a prolonged delay to prevent loss of alveolar ridge height. Tsukiboshi and Tsukiboshi have described the morphological changes in the alveolar bone after delayed replantation of avulsed teeth using three-dimensional CBCT in a central incisor after 9 years of follow-up and concluded that resorption is delayed or arrested around the cervical area superior to alveolar crest. The buccal bone is reduced in thickness but not the palatal bone, which is evident in Case IV and Case V of the present case series. Thus, the buccal profile of alveolar bone in the maxillary anterior region following reimplantation of an incisor depends on the presence of the viable PDL of avulsed tooth. Evaluation of buccal alveolar bone in maxillary anterior and premolar region can be discerned by using CBCT. Maxillary anterior teeth should display buccal alveolar bone thickness >1 mm for implant prosthesis. 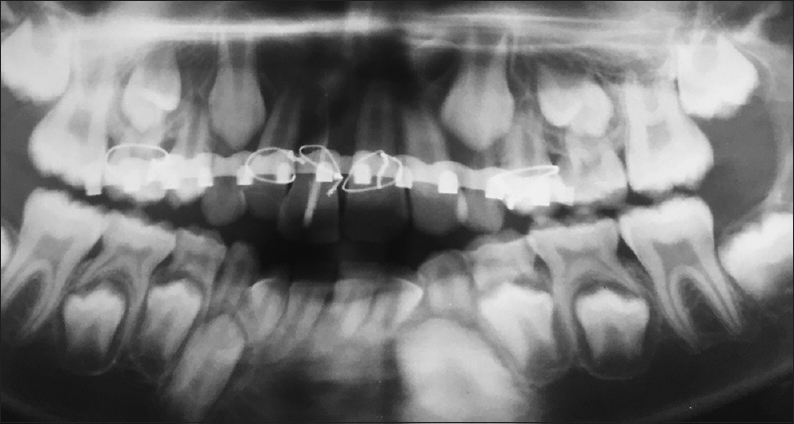 In an 8-year long-term follow-up of a replant case, it was concluded that a similar treatment technique, as reported in the present case series, maintained height of alveolar bone, during the adolescent period, thereby making the provision for an esthetically acceptable permanent restoration at a later age. Hence, in all the cases in the present series, a uniform bone preservation is expected before extraction of the mobile crown favoring the prosthodontic replacements. However, rapid loss of labial alveolar bone is observed in almost all the cases within 3 months of postextraction. In the present case series, extractions were performed due to other compulsions, such as mobility of crown, discoloration, functional loss, and compromised esthetics. The bone loss pattern observed after extraction was similar to that explained by Tsukiboshi and Tsukiboshi, that is, there was a rapid buccal alveolar bone loss, which made the possibility of an implant prosthesis very challenging. Although there is a prolonged extraoral time, tooth replantation is essential to provide esthetic appearance for a young adolescent in the interim phase of growth to boost his/her self-esteem. In spite of delay, replantation succeeds in maintaining the buccal and palatal alveolar bone dimensions for the future implant prosthesis. We thank the postgraduate students of our department for helping in the clinical cases and maintain the radiographs of all the patients. The current paper was presented as a poster on July 3, 2015 at the 25th Congress of the International Association of Paediatric Dentistry (IAPD) held at Glasgow, Scotland, UK from July 1 to 4, 2015. The abstract for the poster is published in the Conference special supplement of International Journal of Paediatric Dentistry. Volume 25, Issue Supplement s1, Pages 1-263, July 2015. Souza BD, Dutra KL, Kuntze MM, Bortoluzzi EA, Flores-Mir C, Reyes-Carmona J, et al. Incidence of root resorption after the replantation of avulsed teeth: A meta-analysis. J Endod 2018;44:1216-27. Finucane D, Kinirons MJ. External inflammatory and replacement resorption of luxated, and avulsed replanted permanent incisors: A review and case presentation. Dent Traumatol 2003;19:170-4. Bakland LK. Root resorption. Dent Clin North Am 1992;36:491-507. Kenny DJ, Barrett EJ, Casas MJ. Avulsions and intrusions: The controversial displacement injuries. J Can Dent Assoc 2003;69:308-13. Seshima F, Ota M, Kinumatsu T, Shibukawa Y, Yamada S. Effect of recombinant basic fibroblast growth factor on reimplanted teeth in beagle dogs. Oral Surg Oral Med Oral Pathol Oral Radiol Endod 2010;109:142-8. 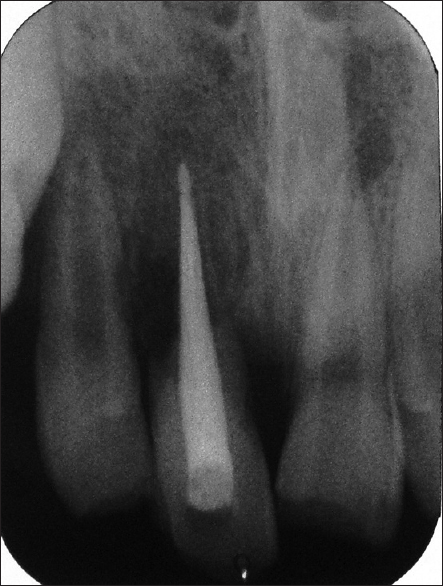 Lindskog S, Pierce AM, Blomlof L, Hammarstrom L. The role of the necrotic periodontal membrane in cementum resorption and ankylosis. Endod Dent Traumatol 1985;1:96-101. Sapir S, Shapira J. Decoronation for the management of an ankylosed young permanent tooth. Dent Traumatol 2008;24:131-5. Kinirons MJ, Gregg TA, Welbury RR, Cole BO. Variations in the presenting and treatment features in reimplanted permanent incisors in children and their effect on the prevalence of root resorption. Br Dent J 2000;189:263-6. Heithersay GS. Replantation of avulsed teeth. A review. Aust Dent J 1975;20:63-72. Evans D. Splinting duration for replanted avulsed teeth. Evid Based Dent 2009;10:104. Mine K, Kanno Z, Muramoto T, Soma K. Occlusal forces promote periodontal healing of transplanted teeth and prevent dentoalveolar ankylosis: An experimental study in rats. Angle Orthod 2005;75:637-44. Sonmez AB, Castelnuovo J. Applications of basic fibroblastic growth factor (FGF-2, bFGF) in dentistry. Dent Traumatol 2014;30:107-11. Panzarini SR, Gulinelli JL, Poi WR, Sonoda CK, Pedrini D, Brandini DA. Treatment of root surface in delayed tooth replantation: A review of literature. Dent Traumatol 2008;24:277-82. 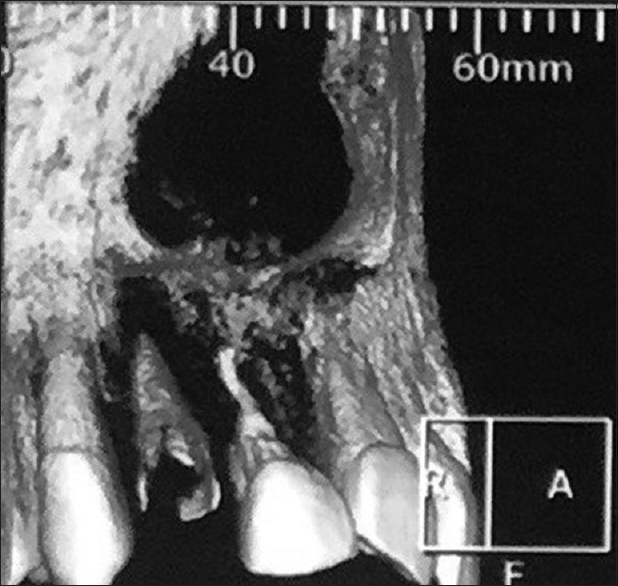 Tsukiboshi M, Tsukiboshi T. Bone morphology after delayed tooth replantation – Case series. Dent Traumatol 2014;30:477-83. Vera C, De Kok IJ, Reinhold D, Limpiphipatanakorn P, Yap AK, Tyndall D, et al. Evaluation of buccal alveolar bone dimension of maxillary anterior and premolar teeth: A cone beam computed tomography investigation. Int J Oral Maxillofac Implants 2012;27:1514-9. Díaz JA, Sandoval HP, Pineda PI, Junod PA. Conservative treatment of an ankylosed tooth after delayed replantation: A case report. Dent Traumatol 2007;23:313-7. Sonoda CK, Poi WR, Panzarini SR, Sottovia AD, Okamoto T. Tooth replantation after keeping the avulsed tooth in oral environment: Case report of a 3-year follow-up. Dent Traumatol 2008;24:373-6. Koca H, Topaloglu-Ak A, Sütekin E, Koca O, Acar S. Delayed replantation of an avulsed tooth after 5 hours of storage in saliva: A case report. Dent Traumatol 2010;26:370-3. Sardana D, Goyal A, Gauba K. Delayed replantation of avulsed tooth with 15-hours extra-oral time: 3-year follow-up. Singapore Dent J 2014;35:71-6. Ines K, Nabiha D. Delayed tooth replantation after traumatic avulsion resulting in complete root resorption. J Pediatr Dent 2016;4:18-23. Carvalho ED, Rosa RH, Pereira FM, Anbinder AL, Mello I, Habitante SM, et al. Effects of diode laser irradiation and fibroblast growth factor on periodontal healing of replanted teeth after extended extra-oral dry time. Dent Traumatol 2017;33:91-9. Priya MH, Tambakad PB, Naidu J. Pulp and periodontal regeneration of an avulsed permanent mature incisor using platelet-rich plasma after delayed replantation: A 12-month clinical case study. J Endod 2016;42:66-71. Tuna EB, Arai K, Tekkesin MS, Seymen F, Gencay K, Kuboyama N, et al. Effect of fibroblast growth factor and enamel matrix derivative treatment on root resorption after delayed replantation. Dent Traumatol 2015;31:49-56.